When my niece first told me the name she'd chosen for her little baby girl was Sophia, I thought it was so pretty, so original, so vintage. 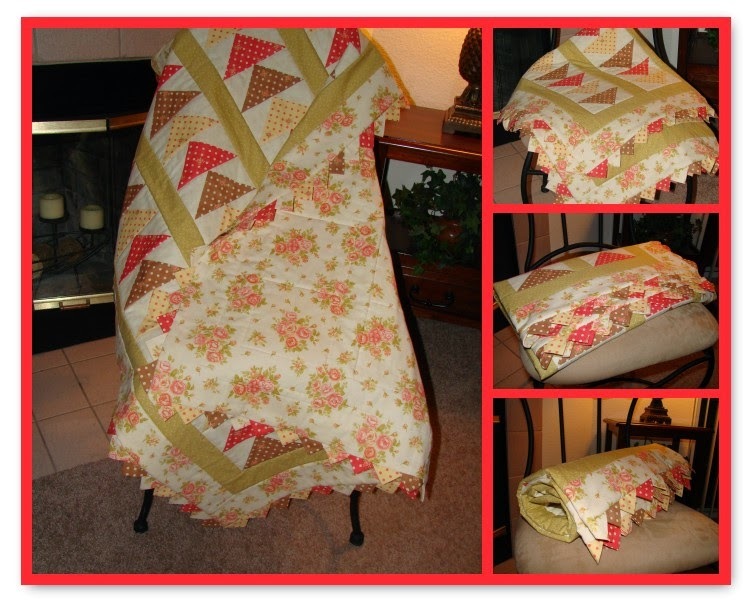 I decided the quilt I would make for Sophie should reflect that vintage feel. I found this pattern, called Baby's Little Goslings, in a book I'd picked up a while ago knowing someday it would be perfect for a very special baby. Instead of more contemporary pastels, I decided to go with the dotted fabric from Fig Tree I'd been holding onto for just the right moment. The soft creamy, peachy, orange florals surrounding the dotted flying geese was also used for the backing. Since I always name my quilts, this one became "So Sweet Sophie"
and I created a label in keeping with the vintage theme. But my very favorite part of this quilt is the prairie point border. Partly because I've been wanting to try something with prairie points, but mostly because I think it's the perfect finish as a reflection of the larger flying geese blocks. For my non-quilting friends, prairie points are those little folded triangles around the edge.